Accommodations: Find some wonderful friends who live in Omaha and stay with them. 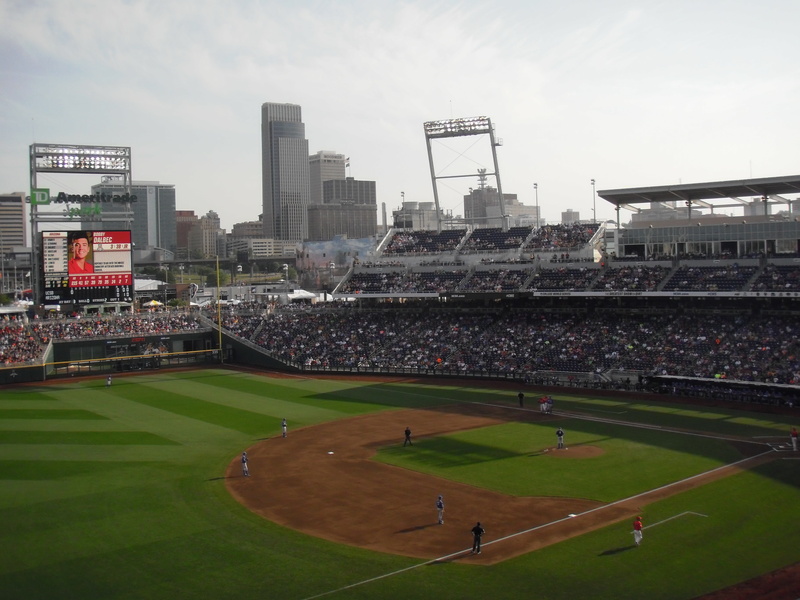 You’re not going to find a hotel room anyway unless you book one now for the 2017 College World Series (CWS). Al and I stayed with Michelle and Tom Koziar who were the most attentive of hosts and we can’t thank them enough for their hospitality! Dining: You’re going to baseball games, so don’t even think about finding some Cornish game hen that’s been braised with some unpronounceable sauce. Think hamburgers and hot dogs, which means Stella’s and B & B Classic Dogs. Stella’s was voted the best hamburger in Nebraska in 2014, and Al swears that it’s the best one he has ever eaten. Stella’s features “The Stellanator,” a dish that begins with six hamburger patties, six eggs and 12 pieces of bacon and ends with peanut butter. If you can eat the whole thing in 45 minutes you win a tee-shirt and your photo on the Wall of Fame. Tom told us that he tried this once and came within a single bite of succeeding before losing it. And by “losing it,” he meant losing all the other bites that he had taken, but let’s not dwell on that image. B & B Classic Dogs features 22 different hot dog combinations using Nathan’s hot dogs. They are meals unto themselves and this is a must-stop for any hot dog aficionado. If you are ready for a little desert after the game, head to Ted and Wally’s Ice Cream downtown. When we arrived after Wednesday’s game the line was out the door, but it was well worth the wait. Made from 18% butterfat and using all local dairy and eggs, this is the creamiest, most deliciouyest ice cream I have ever eaten. It was difficult to pull the spoon out of my Dutch chocolate/chocolate banana bowl. Actually, it was difficult to resist just sticking my face in the bowl and eating my way to the bottom. The SAC museum is huge! right in town. We drove about 45 minutes to visit the Strategic Air Command Museum in Ashland, Nebraska. 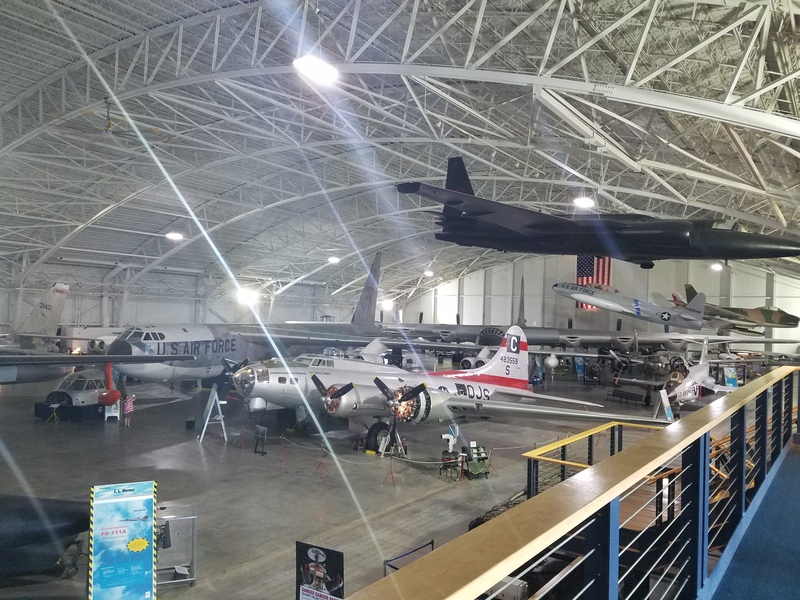 This museum features many of the spy planes used during the Cold War and if you take Tom, who happens to be a Captain in the Air Force or Al, who is a military plane buff, then you don’t even need to read the signs; all you have to do is ask them about the plane in front of you. Tickets: Tickets are easier to come by than you might think. We ordered ours online ahead of time, but there were plenty of people exchanging and selling tickets outside of TD Ameritrade Park. Having sat in the “worst” seat in the house, we can tell you that there aren’t any. We sat in all three levels and actually preferred the third deck from which we could still hear the Oklahoma State coach encouraging his players. Every seat is on top of the action. Ballpark atmosphere: This is a wonderful venue for kids of which there were many in attendance. We heard no cursing, saw no drunks, and fans from competing teams were comrades, not combatants. The bleacher creatures brought dozens of beach balls which were batted about between innings. During one game, they launched them all, along with several inflatable sharks onto the field. The beach balls got tiresome when they escaped onto the field during play, however, and the head coaches were already doing their best to slow the pace of play with their incessant on-field conferences, but I digress. I also appreciated the fact the organist played many classic foxtrot tunes between innings, but I managed to remain in my seat rather than slow-slow-quick-quick down the rows. Souvenirs: Omaha, during the CWS, is full of more tee shirts than the Fruit of the Loom factory. Yes, you can buy mini-bats and full-sized bats and photos, mugs, cups, and key chains, but the tee shirt is the featured item. You will want to wait until your team is eliminated, however, for because then all the shirts go on sale at 50% off. We picked up a couple of Under Armor Florida CWS shirts for only $10.00 apiece. 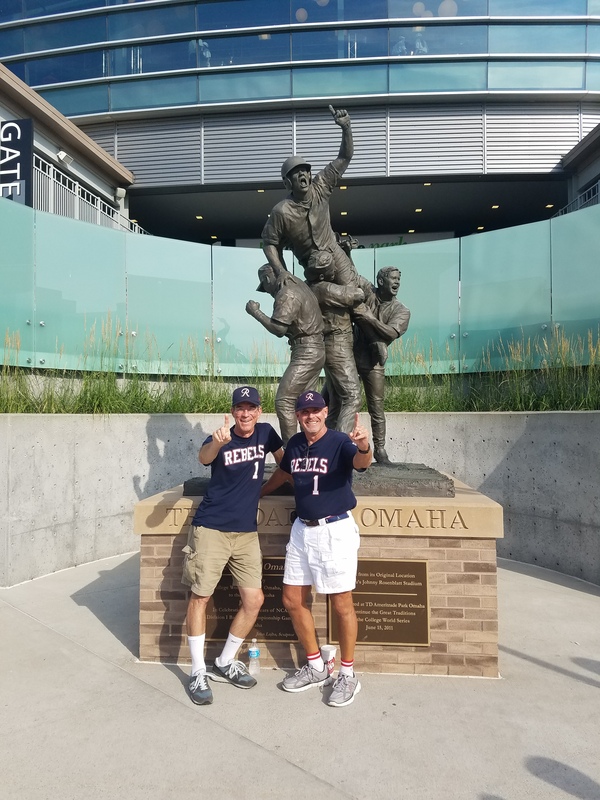 Al and I have been on many baseball pilgrimages, and the College World Series is one of the best. If you like baseball, put this on your bucket list. If you like to visit interesting places, venture to Omaha. After the winner is crowned, either tomorrow night or Wednesday, I will bring you our actual baseball experience. The best two-out-of-three finals features the two teams thought to have the least chance of reaching the finals: Coastal Carolina and Arizona. That’s why you play the games. Oh, and I’m rooting for Coastal Carolina (CCU) because we met Bill Ewing, father of Dalton Ewing, an outfielder for CCU at a Chanticleer practice at one of the local high schools. Yes, Al and I managed to find where these teams workout. (We’re baseball guys; that’s what we do.) Besides, how can you not root for a team named for a rooster in Chaucer’s Canterbury Tales? If you don’t believe me, then as Yogi Berra would say, you can look it up. This entry was posted in Baseball pilgrimages and tagged B & B Classic Hot Dogs, Chanticleers, Coastal Carolina, College World Series, Dalton Ewing, Greatest Show on Dirt, Omaha, SAC Musuem, Stella's of Omaha, TD Ameritrade Park, Ted and Wall's Ice Cream, The Road to Omaha, University of Arizona baseball. Bookmark the permalink. What a great read, Austin. You really are a good writer. Very good insight as always Austin, & what I really appreciated about watching last night’s game was the home plate umpire. He was not only vocal in calling balls & strikes, but let the pitcher know where the pitch was thrown, such as inside, outside etc. More umpires should follow his lead. Glad you & Al had a good time, great food, & gracious hosts. See you in Frederick July 11th. Good observation, Don. We saw a few bad calls, but much worse managing!